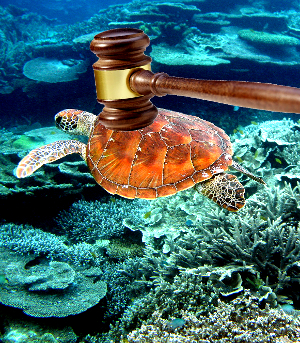 The case challenging the decision to approve the expansion has been filed in Queensland by the Mackay Conservation Group, represented by the Environmental Defenders' Office. Mr Hunt approved the port project with a string of conditions, but the final plan still allows the dump of millions of tonnes of dredge spoil sludge in the Great Barrier Reef World Heritage Area. The case may have implications for governmental decisions regarding other environmentally sensitive projects. “This is a test case. It's a sound case and the prospects of success are reasonably good we believe,” Environmental Defenders' Office solicitor Michael Berkman told reporters in Brisbane. “The world will be watching this case,” Mackay Conservation Group campaign coordinator Ellen Roberts said. Queensland Resources Council chief Michael Roche says it is an affront to the headstrong profitability of the mining industry. “By preventing Abbot Point dredging they are trying to prevent areas like the Galilee Basin getting coal out of the ground,” Roche said. “Let's look at the decision that they are objecting to. “(It) involves very rigorous scientific analysis, it involves 95 conditions imposed by the Minister, it involves delivering a net benefit to water quality in the Great Barrier Reef through needing to offset to the tune of 150%. The North Queensland Conservation Group has launched a separate appeal in regard to the dumping allowance made by the Great Barrier Reef Marine Park Authority (GBRMPA). GBRMPA general manager for Biodiversity, Conservation and Sustainable Use, Bruce Elliot says the body made the right decision. “By granting this permit application with rigorous safeguards, we believe we are able to provide certainty to both the community and the proponent while seeking to ensure transparent and best practice environmental management of the project," he said.